� The next step forward from his rare and valuable past ORIgen sire known as Whiskey from a dam that could be the greatest daughter of the rare and valuable ORIgen sire Connealy Forward, this powerful young sire recently joined the SydGen program to carry on the legacy of those two SydGen cornerstone sires. � As of this writing, with 40 calves with AHIR birth and weaning data and 27 progeny scanned and 26 head weighed as yearlings, Patriarch ranks top 1% of the population for Residual Average Daily Gain EPD, the best prediction of feed efficient growth, top 2% for Yearling Weight EPD, $Feedlot value index and $Beef value index with a top 3% ranking for hot Carcass Weight EPD and percent Heifer Pregnancy EPD and a top 5% ranking for Scrotal Circumference measure EPD to offer elite excellence in both of the best existing predictions of male and female fertility. � With a top 10% ranking for Weaning Weight EPD, $Weaned calf value index and Rib Eye area measure EPD, Patriarch offers a Calving Ease Direct score EPD that is among the top one third of the population. 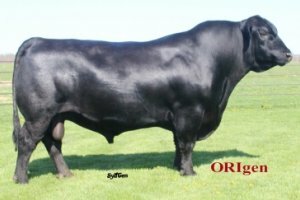 � The long list of herd sire sons produced by the dam of Patriarch are headlined by the ORIgen international favorite SydGen Black Pearl, the $34,000 past SydGen top-seller SydGen Big Medicine 1779 and his $10,000 flush brother that had the top adjusted yearling weight of their calf crop at SydGen. � Patriarch�s flush brother BCA Jack Black sired the highest $Beef value index bull of the 2017 SydGen fall sale where he sold half interest for $14,000 and the first calves at SydGen by Patriarch are eagerly anticipated this fall.